Description: Add a WB UP stack and that makes four trains. Description: Strange visitors to Nahant. Came off of a KCS grain train with . Title: Belle Hop and ex-CNW waiting at Air Line Jct. Description: The Engineer of 4577 tighten the slack up as they prepare to head south with a ribbon rail for the old SP Macaroni ,now KCS Rosneburg Line. Description: A loaded rail train rolls out of Pittsburg with a new crew while the Ditcher Train watches from the yard. Description: NS Southbound Intermodal Train 219 ( Atlanta, Ga. to Meridian, Ms. ) passing through Bessemer, Al. 219 runs as I- ATDA ( Atlanta, Ga. to Dallas, Tx. ) on KCS between Meridian, Ms. & Dallas, Tx. Description: A diverse consist leads KCS Train Q-SHKC-09, passing over the 63rd Street Viaduct on the KCS Pittsburg Sub. Description: As a KCS Crew gets ready to take their grain load KCS Train G-KCDQ-21 from the CP south, UP Train SCBSP 21 cools its heels waiting on the outbound crew to show up at around 0230 in the morning at Air Line Jct. Description: As a KCS Crew gets ready to take their grain load KCS Train G-KCDQ-21 from the CP south, UP Train SCBSP 21 cools its heels waiting on the outbound crew to show up at around 0230 in the morning at Air Line Jct. The puddles are a good indicator that the past 4 days have basically been a constant monsoon in Kansas City. Title: Crew change at Airline Jct. Description: Eastbound KCS manifest train bound for Artesia departing the KCS yard and about to cross the NS. Description: Norfolk Southern Rock Train 68J makes their way Westbound as they pass through Control Point Henry Ellen in Leeds, AL. Description: H KCSH rolls south at Chewie Rd south of Watts with five units. Description: The southbound is rolling away at Chewie Rd showing it has picked up the local units to take to Heavener for servicing. Description: With all the attention given to the new Belle scheme, its easy to overlook that the gray units are slowly disappearing. One has to remember, this was considered a great improvement over the white dip that KCS used for so long. This southbound H reain has picked up the local power at Watts for a trip to Heavener for servicing, making for five gray units, a sight that has become unusual. Description: KCS 4507 AC44CW and KCS 4801 ES44AC bring up the rear of a detouring Kansas City Southern freight rolling on BNSF rails. Description: KCS 4577 AC44CW brings up the rear of a detouring Kansas City Southern train on BNSF trackage. General Electric built this locomotive in November 1999 and delivered it as KCS 2002, becoming KCS 4577 in July 2005. 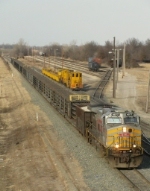 Description: The southbound grain train passes the stuffed and mounted F 7 at Decatur station, itself in the scheme that inspired the one on the active power passing it. Description: Southbound grain led by 4705 rolls past the Decatur passenger station with 75 cars, having just set off 25 at Georges Farms.